CREA Mont-Blanc’s unique identity as both a research and educational institution led it to become an early pioneer of citizen science in France. 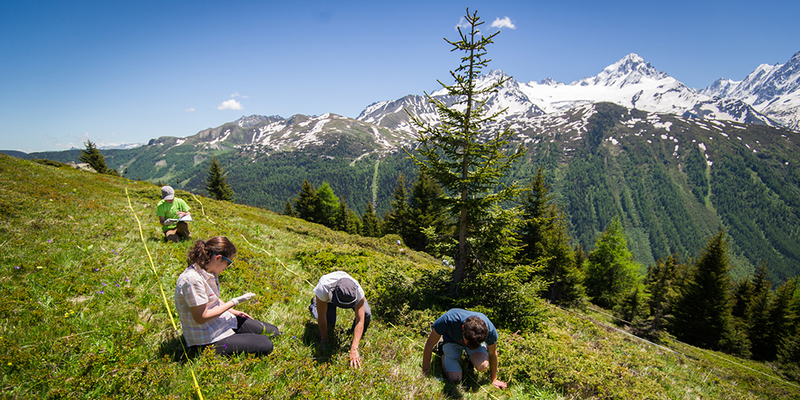 The team at CREA Mont-Blanc sees participatory science as a powerful tool both for collecting high-quality scientific data and for raising public awareness about mountain ecosystems and scientific processes. Since CREA Mont-Blanc began its citizen science programs in the Alps, over 5,000 citizen observers have contributed to our research. For CREA Mont-Blanc, involving citizens in research and data collection has many benefits. Because of the size of their small (but dedicated!) team, the research conducted by CREA Mont-Blanc often requires a quantity of data beyond what the researchers can do themselves. When ordinary citizens help carry out simple scientific protocols, they not only collect much needed data, but they are also able to take ownership over the science and get a first-hand understanding of ongoing environmental changes. When we first launched Phénoclim in 2004, citizen science was still a new idea in France. Today, Phénoclim remains a pioneer in the field and boasts over 40,000 data points collected—an achievement in and of itself since maintaining a network of observers is no small task. In addition to the Phénoclim program, CREA Mont-Blanc has begun developing participatory protocols for the Mont-Blanc Atlas, our research program in the Mont-Blanc range. The success of our approach lies in the relationship we foster between participants, our scientists and our organization. CREA Mont-Blanc manages the observer network and analyzes the date collected. That means that the work of our volunteer observers feeds directly into our research, and they can see the direct results of their contributions. CREA Mont-Blanc also strives to make their citizen science programs inclusive, encouraging participation from people with a wide variety of backgrounds; individuals observing near their homes, schools, park rangers, environmental education centers, tourists and businesses all enrich our programs. CREA Mont-Blanc’s 15 years of experience and expertise has put them at the heart of citizen science networks in France. We are regularly consulted to carry out trainings and advise on best practices. However, rather than being satisfied with what we have built, CREA Mont-Blanc is constantly looking for new ways to innovate. We strive to open up and demystify the scientific process, encouraging participation beyond the classic data collection role. The story of how CREA Mont-Blanc established and maintains 60 temperature stations across the Alps exemplifies our innovation in participation. Responding to a request from CREA Mont-Blanc, engineers from the Somfy Foundation (a privately held company) volunteered to work alongside students from a local technical school to develop tailor-made temperature stations. Since their installation, CREA Mont-Blanc has been able to rely on volunteer technicians from Orange telecommunications who assist with regular maintenance and ensure that reliable data is transmitted back to our research teams. More recent participatory programs include new volunteer programs where both French and English-speaking individuals and students can spend several days in the field assisting our researchers, as well as our upcoming launch of France’s first “creative marathon” or “hackathon” on natural and scientific heritage. During this 3-day immersive Living Lab in Chamonix, 30 expert volunteers from a variety of fields (artists, makers, communication specialists, scenographers, developers and mountain lovers) will use our data and collaborate to produce esthetic and pedagogic devices to better show the current and future evolutions of mountain ecosystems. We also depend on citizen volunteers to help with the installation and maintenance of equipment (like camera traps), simple data analysis and photo data organization. Can research itself be a topic of research? At CREA Mont-Blanc, we strive to better understand and improve the contribution of citizen science on research and on public awareness. We partnered with Geneva University on an initial project completing a sociological analysis of our observers and participants. In addition, we are currently conducting in-depth research on the reliability of data collected by citizens, and techniques for improvement. If you are based in the Alps, you are welcome to join our large network of observers involved in the Phénoclim program. If you happen to hike in the Mont-Blanc massif, we encourage you to check out the species sighting tracker on the Mont Blanc Atlas, and consider recording the flora and fauna you encounter while on the trails. If you are visiting from far away and want to share a week or two with our scientists, you might enjoy one of our Climate Science in Chamonix volunteer programs. Finally, you can also show your support for our scientific adventures by becoming a member of CREA Mont-Blanc!